Combination of propolis extract, vitamin C and Echinacea extract especially designed to support children immunity. Well tolerated by small children. Ingredients: purified water, sugar, glycerin, hydrogenated polyethoxylated castor oil, propolis tincture, Echinacea extract, ascorbic acid, preservative (sodium benzoate), stabilizing agent (sodium edetate). * Nutrient Reference Value according to EU Reg. 1169/2011. - children over 7 years of age: 5 mL (1 teaspoonful) syrup x 3/day. In this category of age, PROPOLIS C ECHINACEA chewable tablets may be administered. ATTENTION! Due to the content in vegetal extracts, depositions on the wall of the bottle may occur. This is why it is recommended to shake the bottle well before use. 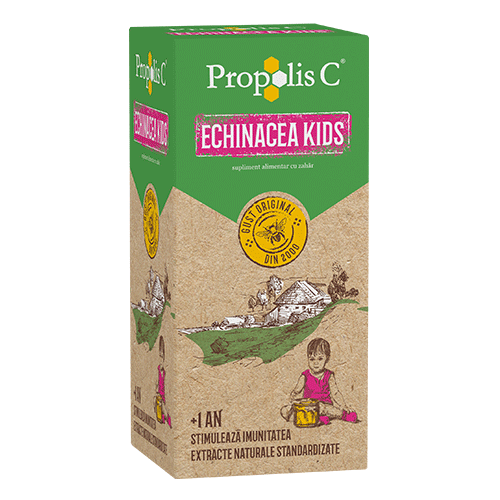 PROPOLIS C ECHINACEA KIDS syrup must not be used for more than 30 days since the first opening of the bottle. - dietary supplements do not replace a balanced diet and a healthy lifestyle. Cardboard box containing 1 bottle with 150 mL syrup.